(Jamaica Observer) Ann-Marie Vaz proved the pollsters right, but her victory in the Portland Eastern parliamentary by-election was closer than anyone projected. Vaz, the candidate for the governing Jamaica Labour Party (JLP) and a political newcomer, polled 9,917 votes to defeat the People’s National Party’s (PNP’s) Damion Crawford by 306 votes to take over a seat which the PNP has held for the past 30 years. “This is what the face of determination looks like. 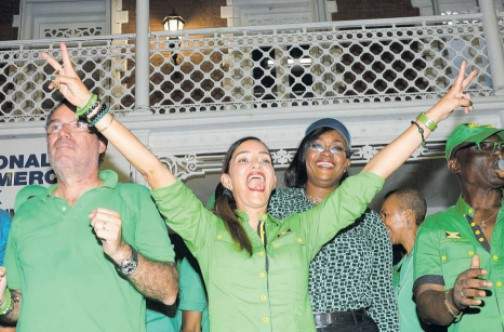 Despite the obstacles I worked for this victory,” an elated Vaz told a noisy group of green-clad JLP supporters following the preliminary counting of the ballots at Port Antonio High School. Later, at a rally in Port Antonio square, Vaz declared that her victory was for all the people of Portland Eastern. “I am standing here tonight because of you. I answered your call and today marks the start of a new dawn in East Portland,” Vaz told a massive crowd of JLP supporters..
“I stand here representing every little girl across this constituency who have big dreams,” added Vaz as she vowed to work to achieve the dreams of all residents of the constituency and move them to prosperity. Ann-Marie Vaz listens as Prime Minister and Jamaica Labour Party leader Andrew Holness addresses a rally in Port Antonio square last night after Vaz won the Portland Eastern parliamentary by-election, ending the People’s National Party’s 30-year hold on the constituency. 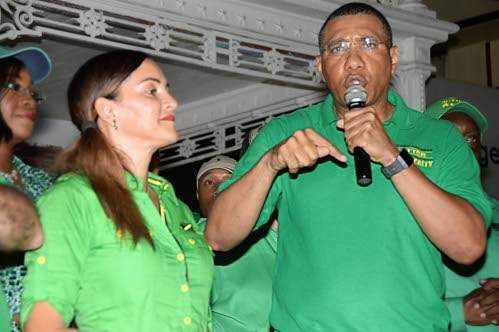 Addressing the crowd, JLP leader and Prime Minister Andrew Holness declared that the party’s victory would lead to an improvement in the lives of the residents and chided the PNP for what he said was the disregard it showed for the people over the past 30 years. Last night, PNP General Secretary Julian Robinson said the party was disappointed with the loss and would do its assessment and move forward, both at the constituency and national levels. “We thank our workers and we want to congratulate the JLP candidate and member of parliament-elect Ann-Marie Vaz,” Robinson said. Crawford, in a social media post, expressed appreciation to the people who supported him. “Supporters, colleagues, family, friends: Thank you for all your hard work & endless support today and over the course of the campaign. The word is LOVE,” he posted on Facebook and Twitter last night. Vaz, who dubbed herself “Action Ann”, campaigned largely on issues affecting the constituency, and even had a television ad featuring her on the hustings telling constituents that “beautiful speaking” could not correct the problems of lack of water, poor roads, their ability to put food on their table, or send their children to school. “Ah action do dat,” she declared. The speech was in response to the PNP’s dig at her that she lacked the gift of the gab. Yesterday morning, before she cast her vote at Drapers All-Age School shortly after 11:00, Vaz told the Jamaica Observer that she was confident of victory. From mid-afternoon the signs were clear that the PNP was scenting defeat as the shouts from its supporters, which greeted our news team early in the day, seemed muted. A takeover of the main street of Port Antonio, a traditional PNP stronghold, by scores of celebrating JLP supporters shortly after 3:00 pm underscored the confidence in the green camp. “It’s over and done,” JLP heavyweight Desmond McKenzie told the Observer as he partied with supporters in the early afternoon. “The PNP have not come out in Port Antonio,” added McKenzie of the division which the JLP had targeted to minimise the extent of its defeat rather than go for a win. The Fairy Hill and Manchioneal divisions, which the JLP had targeted to score heavily, delivered, while the party held its own in the Prospect and Fellowship divisions. The PNP also failed to dominate its Port Antonio stronghold, although the preliminary numbers showed that it retained the division. An official count of the ballots will be conducted today.